Coconut water is the juice in the interior or endosperm of young coconut. This water is one of the nature's most refreshing drinks consumed world-wide for its nutritious and health benefiting properties. The liquid is clear, sweet and sterile and composed of unique elements like vitamins, minerals, electrolytes, enzymes, amino acids and phyto-hormones. Coconut water contains organic compounds that are low in calories (19kcal/100ml), sugar and it is also said to have various medicinal benefits. Coconut water is a very refreshing drink to beat tropical summer thirst. Helps to keep the body cool and also aids in maintaining a normal body temperature. It facilitates the effective transfer of nutrients and oxygen to the cells. As coconut water is an isotonic beverage, it orally re-hydrates the body and naturally replenishes the body's fluids, which are lost in various activities like sports, exercise, etc. Coconut water contains very good amount of electrolyte potassium. 100 ml of water has 250 mg of potassium and 105 mg of sodium. Together these electrolytes help replenish electrolytes deficiency in the body due to diarrhea and vomiting. It is beneficial in treating kidney and urethral stones. It is said to improve the immune system as it contains essential minerals. As you all can see, this coconut water is said to have amazing health benefits. 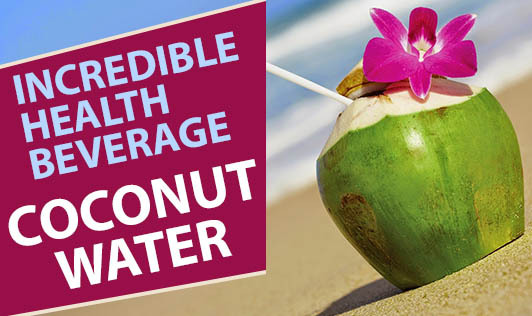 Hence replace your non- healthy drinks with the healthy alternative that is the coconut water!